Mustafa Kemal Atatürk, founder of modern Turkey. The news coming out of Turkey of late has been dispiriting, to say the least. The Turks were one of America’s greatest allies during the Cold War. Indeed, the West and Turkey were brothers united in our commitment to curbing Soviet aggression. With the fall of the Ottoman Empire, Mustafa Kemal Atatürk arose and eschewed the reestablishing of religion as a basis for governing in Turkey. He established a militantly secular strongman presidency. From Atatürk onward, a military junta ran Turkey, maintaining Turkey’s commitment to the West during the Cold War and stymying the vituperative Islamist elements within Turkish society. That all changed when the Justice and Development Party (AKP) was swept into office after the last military strongman was ousted from office in the 1990s. From then on, the country lurched closer and closer to Islamism, as the AKP was an openly Islamist political party. President Recep Erdogan representing his Justice and Development Party (AKP). Now, today, the country is run under the quasi-dictatorship of Recep Erdogan. President Erdogan has steadily aggregated greater levels of power toward himself. He has acted extra-judicially; Erdogan has used his high office to enrich his family members, himself, and his friends. What’s more, Erdogan has steadily purged political opponents from the government. Beginning in 2013, there was a sea change in Turkey’s politics, when Erdogan really ruptured his relationship with the West by cracking down hard on democratic protesters. When this occurred, Erdogan likely assumed that it was only a matter of time before the West would turn on him, so he sought to build relationships beyond his usual Western allies. He looked to unlikely places, such as Shiite-dominated Iran and traditional Turkish rival, Russia. They were united in one, significant way: over energy pipelines. As I’ve noted previously on this subject, Erdogan is deeply committed to ensuring that Turkey remains at the hub of the energy nexus that Russia has been intent on building, connecting Russia with the Mideast. If Russia and Iran are able to build their pipeline system through Syria, as Putin has long desired, then Turkey will stand to benefit significantly in the form of transit fees. Gallery of Rogues. (From left to right): Iranian President Rouhani, Russian President Putin, and Turkish President Erdogan. Not only does Erdogan desire to enrich both himself and his cronies, but he is also deeply wedded to the Neo-Ottomanist ideology. This is exactly what it sounds like: Erdogan views himself as essentially a new sultan who intends on reestablishing the long-defunct Ottoman Empire. This explains Erdogan’s recent geopolitical maneuvers in the Mideast: supporting Islamist movements in their attempts to run secular strongmen out of power. Erdogan believes that the rise of Islamist political parties, not unlike his own AKP in Turkey, will create a vast sphere of influence. If not for the fact that Russia and Iran are protecting Bashar al-Assad in Syria, and that Syria is a key point for the Russia-Iran pipeline, Erdogan would have likely doubled-down on his previous calls for regime change in Syria. But, every autocrat has his price, I suppose. It is Erdogan’s desire to reconstitute the old Ottoman sphere of influence that compels him to eschew his traditional Western allies (while double-dealing with Russia and Iran), and quietly support the Islamic State of Iraq and Al Sham (ISIS). You see, in the fight against ISIS, the U.S. is the biggest international player, but the most potent indigenous force has been the Kurds. Therein lies the rub for the Turks: the Kurds are a divided people. They are relegated to part of northern Iraq, a tiny part of Iran, and part of Turkey itself. For decades, the Turks and Kurds have waged war upon each other because the Turks refuse to accede to Kurdish calls for independence. After all, the Turks would stand to lose a considerable portion of their territory, meaning that the entire Neo-Ottomanist enterprise would be dead, as Turkey would be a shriveled husk of what it is today. Erdogan, therefore, cannot abide by any agitations for independence on the part of the Kurds. This explains why he has been more interested in empowering ISIS in slaughtering as many Kurds as possible rather than lend critical military support to the U.S.-backed war effort against ISIS. In Erdogan’s eyes, such support would ultimately benefit the Kurdish separatists that Erdogan has spent so long suppressing. But, for the U.S., the Kurds are on the vanguard in the fight against the Islamic State. Theirs is the most effective ground force consistently engaged in combat operations against ISIS. Indeed, the Kurds have pleaded with the previous Obama Administration for years for greater support in the form of weapons. Unfortunately, the former Obama Administration did not want to rock the boat too hard in the Mideast and upset America’s long-time ally of Turkey. So, the U.S. under Obama always straddled the line between being supportive of the Kurds and ignoring them. We provided critical intelligence, embedded U.S. Special Forces elements with the fearless Kurdish Peshmerga forces, and provided critical air support for Kurdish units engaged in combat against ISIS. The proposed state of Kurdistanistan (it cuts into Iran, Iraq, Syria, Armenia, and large chunks of Turkey). Now, however, the newly minted Trump Administration has rightly opted to begin supplying critical weapons to the Kurds. In turn, this has agitated Turkey’s President Erdogan and caused previously warm relations between Trump and Erdogan to cool overnight. The fact of the matter is that Turkey is engaged in a quixotic endeavor to benefit financially from a potential Russia-Iran-Syria pipeline that cannot be built until Assad’s position in Syria is secured, while at the same time Erdogan hopes to benefit from his country’s position as the leading edge of NATO’s southern flank. All the meanwhile Erdogan intends on suppressing his Kurdish population–even if it means covertly supporting ISIS and working against its NATO partners engaged in the struggle against the Islamic State. It is important to note, that the U.S. attempts to arm the Kurds in the run up to the massive coalition assault on ISIS-occupied Mosul, the arms are being relegated to mostly small arms and ammunition. U.S. Secretary of Defense Jim Mattis has insisted that the U.S. plans on reclaiming all weapons that it gives to the Kurds after ISIS has been defeated. However, given how ineffective previous buy-back programs have been, from trying to reclaim MANPADS given to the Mujahideen fighters following the Soviet-Afghan War, to trying to ensure that similar weapons do not fall from Syrian Rebels’ hands into ISIS hands, the Turks are smart to be skeptical of the Pentagon’s ability to get the Kurds to return the weapons that America provides. Besides, what’s to stop Turkey from rolling in and smashing the Kurds after ISIS is defeated? The Kurds know this and are unlikely to relinquish their American-supplied arms after the fight against ISIS is over. Erdogan’s kabuki dance will end in disaster for Turkey. He will have to decide. Erdogan has foolishly positioned himself on all sides of the fight against ISIS. While he does not want to alienate the U.S., and he does want to benefit from the proposed Russia-Iran pipeline, Erdogan’s immediate concern is keeping the Kurds down. This, then, is inimical to the American national interest, which is most assuredly defeating the Islamic State as efficiently as possible. Arming the Kurds is the best way of accomplishing this task. But, I doubt that the Kurds, after having suffered so long, will accept a return to the status quo. They will inevitably push for their own independence, in order to prevent another massacre of their brethren. President Trump should not fool himself: Erdogan is an Islamist dictator whose interests are now running against America’s in the Mideast. Even still, the Trump Administration has considerable diplomatic and economic sway over Turkey today. They should immediately begin pressuring Erdogan to back off when it comes to the Kurds. Trump has not arrayed himself on the side of Kurdish independence (though, let’s get real here, that’s where the Kurds are headed). Erdogan is foolish for trying to antagonize proxies of the U.S. (when he himself is technically a proxy of the U.S. in the region). Should Erdogan continue to meddle in America’s fight against the Islamic State; should he continue to leave his borders open, allowing for Islamists to filter unquestionably into Europe; should he continue playing both Assad and ISIS off of each other, thereby destabilizing the entire region; should he continue moving not just economically and politically, but also militarily close to Russia, the U.S. must be willing to sever ties with Turkey. 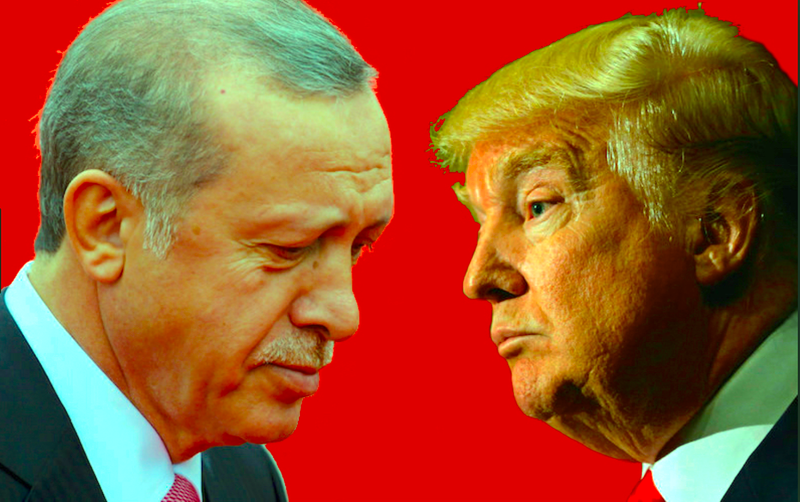 Trump must be willing to seriously punish Erdogan and to raise the costs of challenging American national interests vis-a-vis the fight against ISIS to exorbitant levels. Make no mistake: Turkey under Erdogan is not serious about fighting ISIS. The Western powers should act accordingly. What’s more, the Trump Administration should prepare itself for the inevitable Kurdish push for independence. One way or the other, America will be on someone’s bad side. Will it be Turkey or the Kurds?